The Cookie Swivel was created with cookiers in mind, specifically THIS cookier. 😉 While I would like to take all the credit for this little tool, my dad is the brains behind it. My dad has always been a “handy man” building things for our home (entertainment centers, dressers, chests, etc) out of wood. His garage is his workshop and his “happy place” much like our cookie room or kitchen is ours. One day, while mindlessly scrolling Pinterest, I came across this beautiful vibrant set from Sweet T Cakes. I had a current love/hate relationship with all things floral, but the beautiful ruffle flower caught my eye. I HAD to figure out how to make it! After discussing with some cookie friends (Thanks Bs! 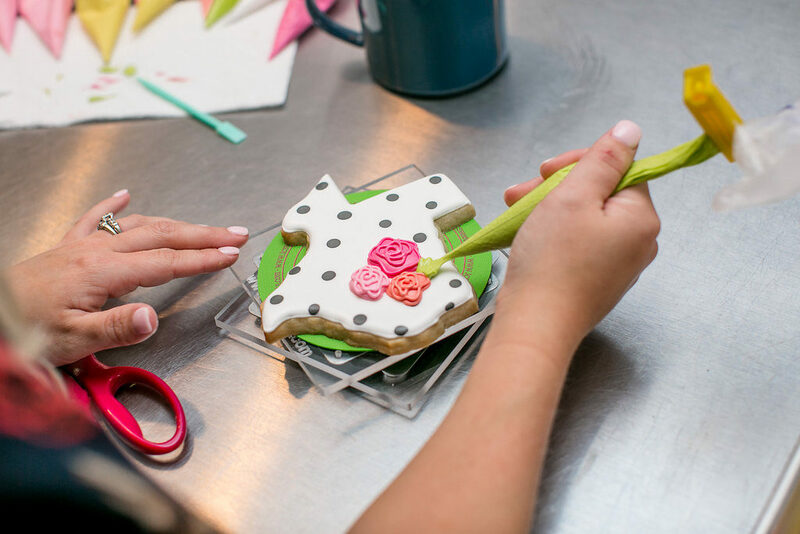 ), I learned that it took a larger petal tip, a special angle and the ability to rotate the cookie without messing up the edges. 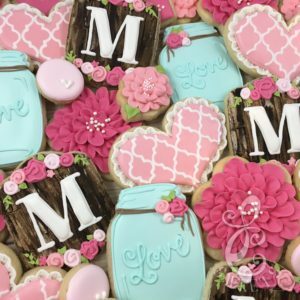 Shortly after unsuccessfully attempting to create beautiful flower cookies I reach out to my dad to see if he could create something to help. I told him I needed a cookie size lazy susan. At that time, there was nothing on the market that fulfilled what I needed. I had seen people using cake turn tables, but those are big and bulky. I had seen someone using a wooden lazy susan, but anything wooden grosses me out (porous surface – even sealed – and butter don’t go together…I don’t even use a wooden rolling pin). He probed for a few details (size, use, etc.) and began doing what he does – creating! It is square for easy turning. Your finger catches the corner perfectly. It comes apart for easy cleaning. Be sure not to get the metal piece wet! It has rubber feet so it doesn’t scoot around while you work. There is no lip or edge so that you can slide your cookie right off the top. 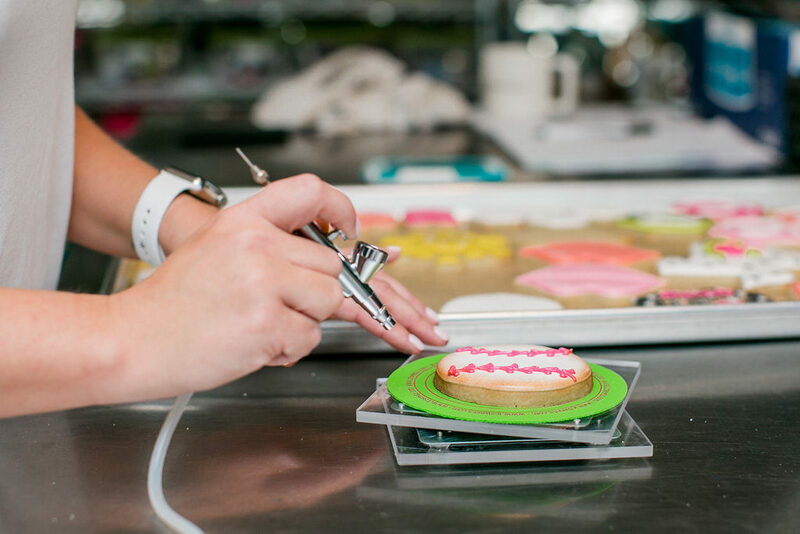 (Enter: The Swivel Grip – a special mat to help prevent your cookie from slipping around on the top while decorating but still allowing you to scoot it off the edge to move it) This helps with decorating to the very edge of the cookie, as well as handling your cookie less. It is made out of acrylic for easy cleaning and durability. It has smooth gliding metal swivels for easy spinning. Again, DO NOT get it wet! You will have a sad swivel that doesn’t swivel! It is the perfect cookie size – 5″. 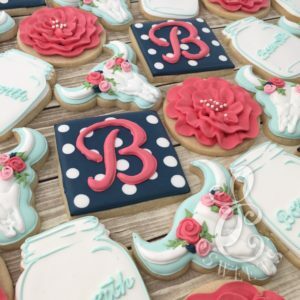 It is the perfect cookie height for comfortable decorating. All of these details were thought of by my dad (clearly an engineer, huh?). No detail was left behind! 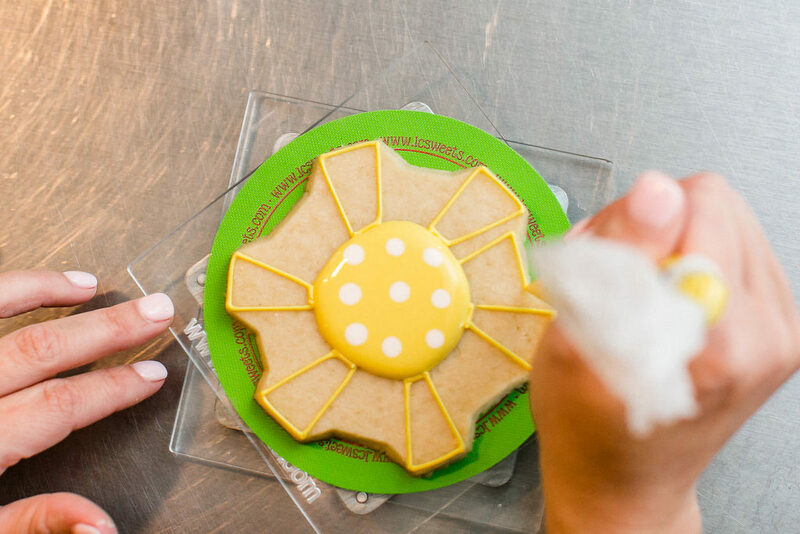 The Cookie Swivel makes it easy to continuously rotate the cookie while creating a ruffle flower. You can achieve a smooth continuous flow, or pull back for individual petals. It is also nice to be able to easily slide it off the top plate without having to mess up the pretty ruffle edges. 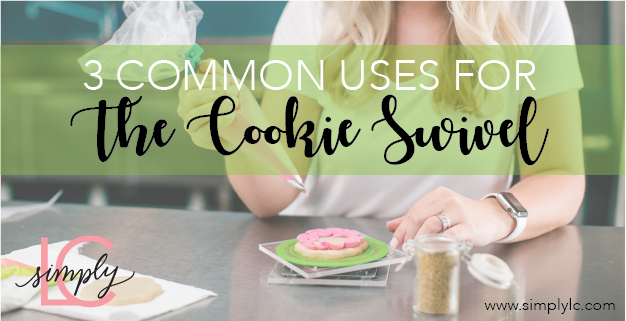 Rather than awkwardly reaching around or angling your wrist, The Cookie Swivel helps rotate the cookie so you can smoothly create a design from all angles. It also helps when piping borders, making sure you get a nice consistent line. The Cookie Swivel is a LIFE SAVER when adding leaves to bunches of flowers! 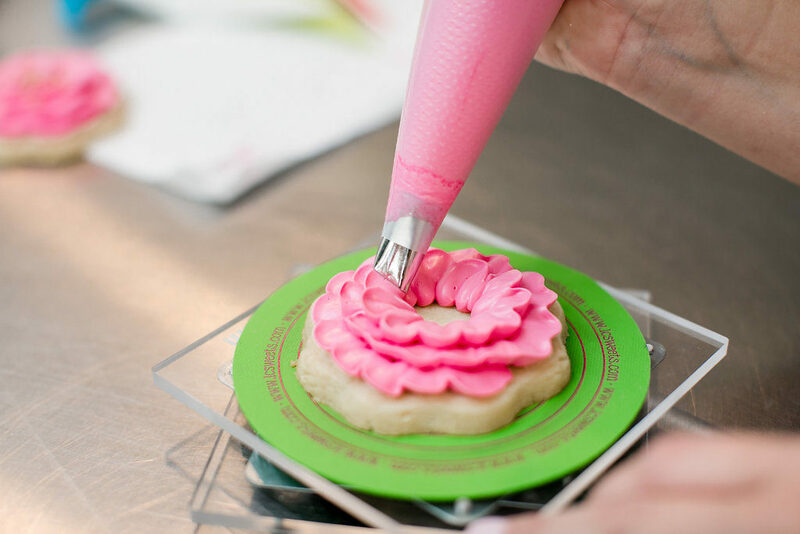 The Cookie Swivel is perfect for airbrushing the edges of your cookies. You can create seamless shading with a flick of the wrist. 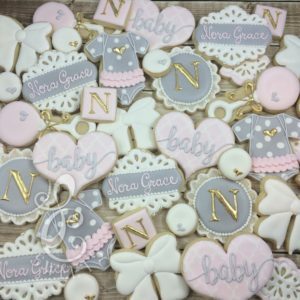 You can also use your Stencil Genie or Stencil Snap on The Cookie Swivel, you just have to rotate it to sit on the corners (or use the option large top plate). The larger 7″ top plate is an add on for those wanting to swivel multiple cookies at once. Shout out to Janis Bakes for requesting this add on! The Cookie Swivel was used for the ruffle flower and to add greenery to the skull. The Cookie Swivel was used to create perfectly circular lines on the tree stumps. 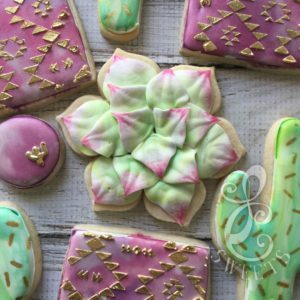 The Cookie Swivel was used to pipe the succulent leaves as well as paint the accents. The Cookie Swivel was used for the ruffle flower, the brushed embroidery edge on the heart and adding greenery to the flower frames. 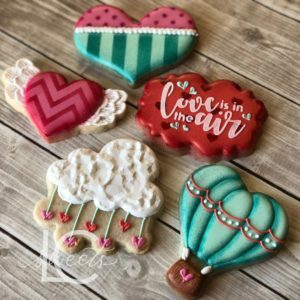 The Cookie Swivel was used for airbrushing the accented edges to add dimension. 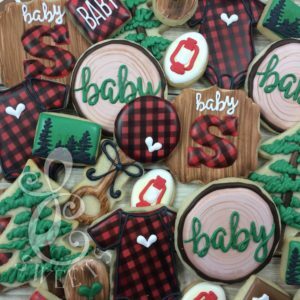 The Cookie Swivel was used for the ruffle on the onesie, the brushed embroidery edge on the initial cookie as well as the eyelet plaques. Do you use The Cookie Swivel? What is your favorite thing about it? As a special THANK YOU to my readers (specifically those that made it this far on this post…ha!)  please use the code “SIMPLYLC” at checkout to receive 15% off all Cookie Swivel items (The Cookie Swivel, Swivel Grip, Top Plate, Additional Spinner).